We have removed last names to protect the privacy of our Clients, our extended family. We would like to increase Linda’s visits, Dad thinks the world of her and really enjoys her company. Both Linda and Ned have really been Guardian Angels for our family, as well Amanda and Jeremiah (Office Staff). It gives me great comfort knowing that Dad and (Brother) Jim are in the care of competent, caring people…bless you for that! We are so fond of you and your dedication and we never knew how to properly say Thank you. We wish you all the success that you so deserve. You certainly can feel good about the job you do. Our Angel is very loving and caring and we are blessed to have her. We are very happy with your service and glad you are always on top of things. You have been real Angels! Service is spectacular, just amazing. Everyone did a really good job and I gained 3 pounds since I started with caregivers and that’s really, really good news. It is clear you all are in the right business. Doing wonderful work while helping our community. I Need An Angel works so hard for us and does a great job, we really appreciate it. Very pleased with the service, very qualified. Everyone did a really good job. My brother and I have noticed a big difference in our Mom. She even called me pretty girl. We are so appreciative of you and what you do. I know Dad can be tough to be around but OMG so very pleased with your services. I appreciate you so much and absolutely recommend your company. My parents are really happy with everything. The staff is very friendly, always smiling and happy. My mom really looks forward to the company. I am very satisfied with the service. You guys are great. I love my Caregiver and I wouldn’t change a thing. You have so much to deal with and still you have a great team. You guys are doing a fantastic job and are a very solid company. I love your service and I referred you to my friends. You actually do what you say and your office staff is great. Very satisfied with I Need An Angel services! I am thoroughly impressed and very pleased with your services. Service is great, my Angel is very good, polite and great at listening to my needs. You are the most amazing organization out there. No one does what you do for your Clients. I really enjoyed the staff coming over and getting my home ready for her when she got out of the hospital. I can tell that our staff really cares about helping and its makes me feel better about humanity. It was so nice to come home to a safe environment and I am very grateful for all your hard work. I am crazy about my caregiver she is so efficient. I rate your service A+++. I found you in the bulletin and everyone should know about you. Services are great! I wish I would have known about you guys earlier. I am so happy with your service, it is so much more than I expected, it has just been great. I appreciate how wonderful and nice the staff has been and my Mom is so pleased. Things are Perfect! Our Angel dotes on Mom, and she really anticipates her needs. Great match she needed someone who is less clinical and more interesting. She hasn’t had one case of thrush and I contribute that to your care. Great job. I saw your ad in the OLPH bulletin and referred you to my neighbor. You met her at the hospital and then started services for her on Saturday. I just had to tell you that you guys are awesome! You are doing a great job and my neighbor and I are very impressed by the person you sent. I am so glad I found you. We are very pleased with everything you do. The Caregivers go above and beyond. We couldn’t be happier with your service. Services were GREAT! I wouldn’t change anything about your services. My Mother is doing better than ever. You are EXCELLENT!! I grade you an A in service. You anticipate needs and I really enjoy the staff. It is common to complain but I have to tell you I am amazed. Your service is wonderful and I am very content and kudos’s to you!!! I really appreciate everything you do. I am happy to have you and your Angels to always help me out. I appreciate and admire the calm I Need An Angel represents in a critical situation. I appreciate the great clarity they have as well. Thank you for all your help over the years. I don’t know how you do it. You are heroes! You are more than an agency and you go out of your way and really care about Allen. I am so glad for it. Allen said he is so blessed to have two fine ladies to work with him and be able to have the office handle anything that comes up. My Caregiver, Barbara with I Need An Angel is great. She is truly the best Caregiver I have had with an Agency and she is the best fit for my Sally. I am very pleased with the services I have received. Our Caregiver is an excellent Angel and a blessing to my mother. She is doing an excellent job. She is sensitive to my mother’s age related limitations, she is very responsible and efficient in her communications, and takes initiative like a daughter would do to protect an aging parent. My Mother appreciates her and their comfortable relationship. It’s nice for my Mother to look forward to her Angel coming every week. We are very pleased with the services of I Need An Angel. Thank you for giving us peace. It a “Divine” fit! Thank you! Ya’ll went way, way, way above and beyond! Thank you!! I really am very impressed. I’ve worked in healthcare for many years, and I do understand how much you guys are going the extra mile. So again, thank you!! I want to bless you and bless your work, you have always been there for me. I love you all! I’m very glad that INA is looking after my aunt, and especially pleased that she has been able to remain home as long as she has. That’s the type of care I would want if I live that long! It is my pleasure to recommend I Need An Angel to anyone in need of in home care and support. My Mother was cared for with the utmost attention and all my requirements and requests were addressed immediately. I was immediately advised of any significant situation or changes in her condition that may have required further attention. I travel extensively and was completely confident to leave for extended periods of time. The care givers paid great attention to my Mother’s food choices, how she liked meals prepared and accommodated any needs and requests she had around the clock. They were engaging and ensured they kept her involved in regular dialogue and conversation to her maximum capacity. So for the families as well as the individual, I Need An Angel is the BEST choice for in-home care at any level, from interim support to 24 hours live in requirements. It is my pleasure to recommend I Need An Angel to anyone in need of in home care and support. My Mother was cared for with the utmost attention and all my requirements and requests were addressed immediately. I was immediately advised of any significant situation or changes in her condition that may have required further attention. I travel extensively and was completely confident to leave for extended periods of time. The care givers paid great attention to my Mother’s food choices, how she liked meals prepared and accommodated any needs and requests she had around the clock. They were engaging and ensured they kept her involved in regular dialogue and conversation to her maximum capacity. So for the families as well as the individual, I Need An Angel is the BEST choice for in-home care at any level, from interim support to 24 hours live in requirements. You guys are the BEST, I Love You! Life is about working together, and I am so grateful for everything I Need An Angel has done for me. It means the world to me, and as long as you guys are with me I know I am going to be all right. You are passionate about what you do and It is extremely evident how much you care for your patients. Before I Need An Angel, I spent two years hiring agencies and people just so my Mom could fire them. I love how they stay two steps ahead. My Mom has always undermined everything and they are smart thinkers. I Need An Angel staff is always professional, they do such a good job- it is a pleasure working with them. I wanted to thank you for everything. I am very happy with your services. I am so impressed with your services. You do a lovely job and I appreciate you so much. I didn’t know about your services before and I wish I did. You make things so easy. Thanks for the temporary help, we appreciate your quality care. You should know your Caregiver was top quality hold on to her. I will certainly request her if we need anything in the future. Very good service, what a great talent in placing people. I appreciate the intuition and the wise ability you bring to the service. Mom has the perfect Angel, a good match you are so amazing. I think your service is a brand of its own. I love that you take the time to talk through things and figure them out. I want to congratulate you all on such a well run company. Our Caregiver is wonderful and Dad loves her. You are a wonderful company and everyone has been so good to us. I highly recommend Rebecca and Amanda to anyone who needs this service. How do you do it? I wished your company was in Ohio for my Mom. You are so helpful and I appreciate everything you do. My Mom has Alzheimer’s and my daughter had to go to the hospital for an emergency with my grandson. It was a miracle to get help right away so I could be with family in the hospital. It was a leap of faith to think they could even respond so quickly. Thanks so much I Need An Angel you are an amazing company in every way! My family loves the Caregiver, she interacts well and we feel very comfortable. Can’t believe you had someone who speaks Italian. Great job. At first, I was really worried about a match and now my husband asks if his Caregiver is coming this week. That is so exciting for me. Your organization is very supportive and I appreciate you tremendously. Very happy with your services and the Caregiver. Service is Great. I am very happy with your services and would recommend you to anyone. Thank you for such a good job. Your service was is exactly what we needed. It is so nice to have consistency. Everyone has been so nice, you have really help us when we were in a difficult time. You just handle things so well. Everything is going very well, just beautifully. My Caregiver has the exact skills that I need which is important for my healing process. I am very pleased and so very happy; everything is so amazing and beautiful. Everything is wonderful. The Caregivers arrive on time and complete all the daily tasks. Both of our Caregivers are great and I love that you always keep me informed. I have only good things to say about your organization. I actually pass out your brochures because we are so pleased with the services you provide. I have heard nothing but good things about your organization and they were right. The Caregivers are great. Don’t know what we would do without them!! I appreciate you guys and everything you do. I am so glad you have expanded your services to help us in any way you can. You guys are wonderful. It is just great how you helped in a difficult situation. You work so hard to help them in every way. Fantastic Job! I am very satisfied with your service you really know how to handle Clients needs. 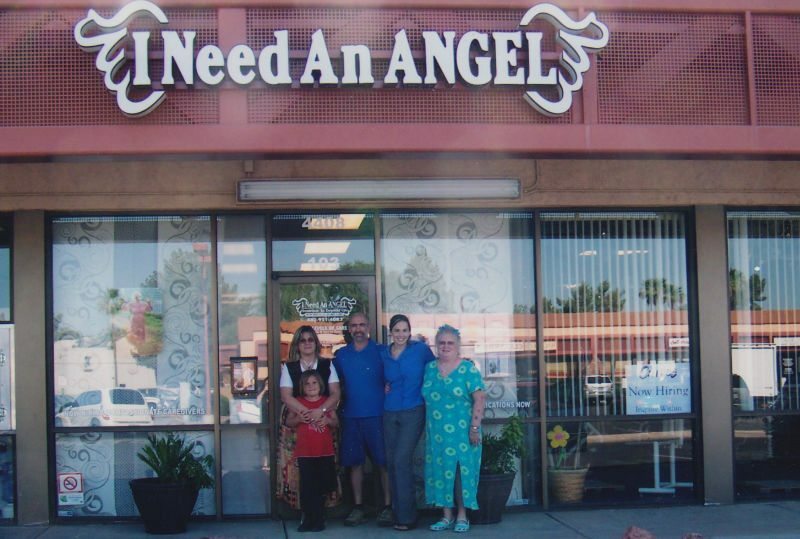 I appreciate I Need An Angel’s good service. I feel supported and taken care of. Not only will I continue to use your services I will refer you to others. You guys are Awesome; you always go above and beyond on everything you do!! I am very thankful for all you do. You are ANGELS! Thank you for everything you do for our family. I really appreciate you going above and beyond for us. As an Elder care Adviser and Regional Director of A Place for Mom for more than 4000 families, I consistently received high praise from families who I referred to INA. I found I Need An Angel to be very professional, extremely reliable, and positive. They always tried hard to exceed client expectations. INA has consistently been able to provide a well-matched caregiver, not just a warm body, because they screen applicants to find the best, then treat them well.I am retired now. I will not hesitate to contact I Need An Angel if I or a loved one need home care. I am so pleased with I Need An Angel. My husband and I really enjoy Janice and I feel confident going to the store now and my husband doesn’t say he doesn’t need a babysitter anymore because they are having fun. She reads to him and they do exercises. You are such a good company and I know because I have tried other care companies in the past. You have the highest quality staff who really have a good understanding of my Moms needs. She has lived to be 100 because of you and the matches you do. My Angel is very attentive to my husbands needs. I could not get by without her. I just had to let you know we are very pleased. What a service you have. It is an AMAZING Joy to have I Need An Angel involved with my Mom. You have lifted my Stress 90% Thank You. The staff did a wonderful job, and we are extremely happy with our service. We will definitely recommend you to others. Your service is excellent!!! My parents were reluctant and now they are very pleased. We wouldn’t change a thing. Your services are Superior! Your staff is very watchful and caught symptoms early. Knowledge is power. I would definitely not hesitate to recommend your service to everyone. You should be in the "know"! We guarantee you will "LEARN INSIDER SECRETS", to make an informed choice. PLEASE CALL (480) 951-4083 TO SPEAK WITH A REPRESENTATIVE IMMEDIATELY.